Jamie says: I felt like the garlic queen. I cooked two dishes with garlic (one of which this blog post is about) and defrosted another garlic-containing meal from the fridge. Garlic is quite amazing. It was so good that I went back for thirds. Yes, vegetables can be that good. Why was it so good? 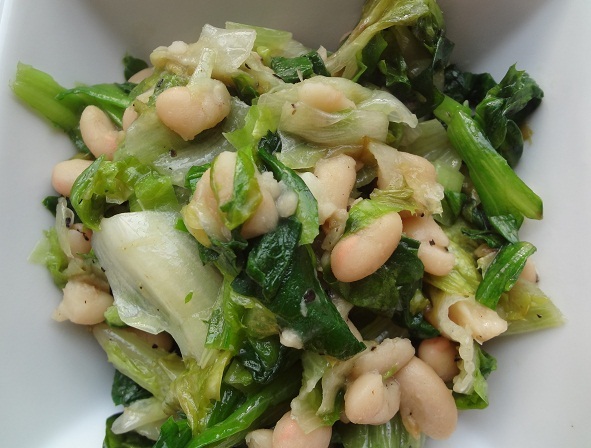 The tender escarole and warm beans were coated in delicious, garlicky olive oil. Yum! Peel and chop garlic. 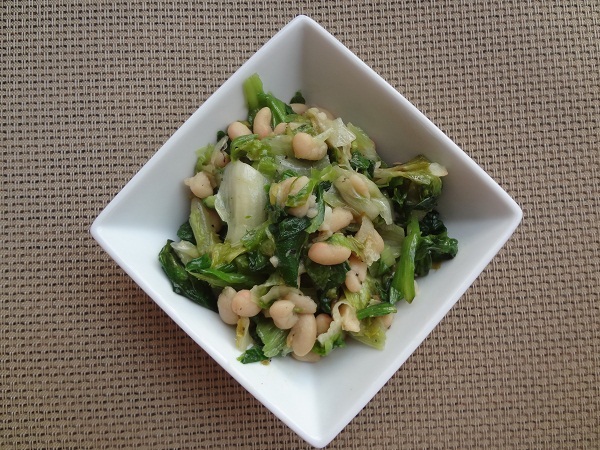 Chop escarole into thick pieces. Pour beans into a colander, rinse, and drain. Preheat a large saute pan on medium heat. Pour extra virgin olive oil in pan. Add garlic to the oil. Allow garlic to lightly brown (about 2 minutes). Add escarole, sea salt, and freshly ground pepper to pan. Stir and cook for about 5 minutes, stirring occasionally. Add drained beans. Heat for an additional 3 minutes or until warm. 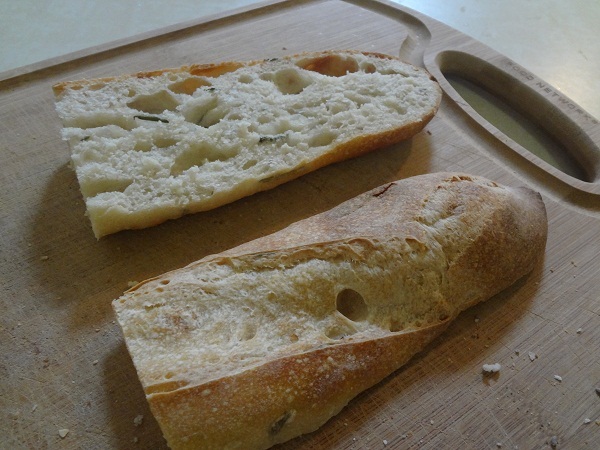 I brought the loaf home from Vine at the farmers’ market and cut it into fourths. Then I cut each piece in half and placed them in a gallon sized Ziploc bag to keep them fresh. I then took pieces out of the freezer and they’re still so fresh. After cooking all day at work, I wanted an easy dinner that was also satisfying. 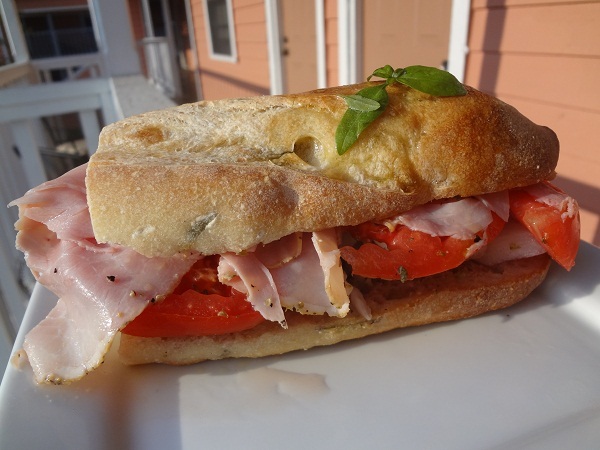 I made this Rosemary Baguette Ham Sandwich with Fresh Mozzarella, Tomatoes, and Basil. I served it with fat free cottage cheese and fresh squeezed orange juice from the farmers’ market. 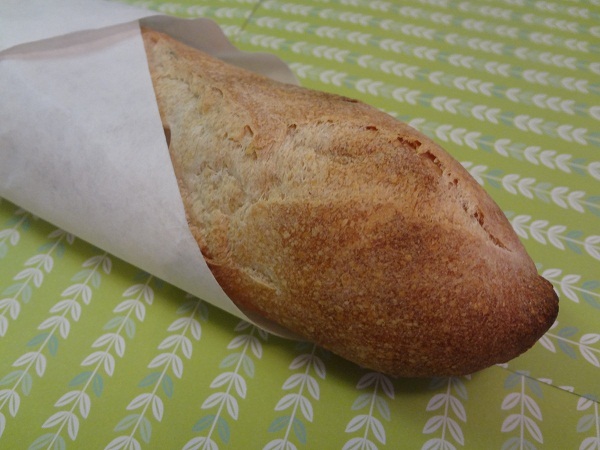 Slice baguette in half. Place halves in the toaster to toast and heat. Drizzle inside with extra virgin olive oil and vinegar and sprinkle with oregano. Press halves together to distribute ingredients. 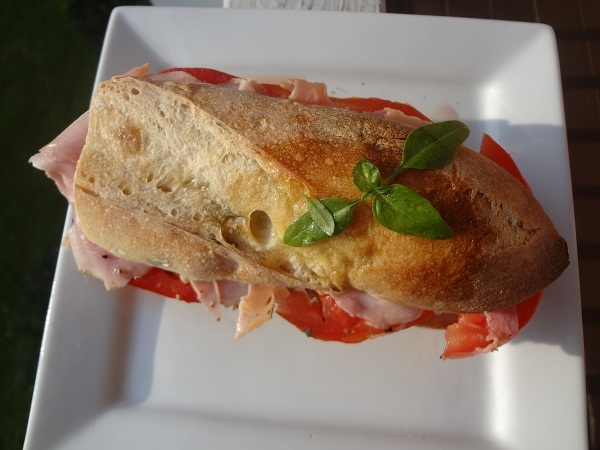 Add sea salt and freshly ground pepper to tomato slices and place on bottom half of baguette. 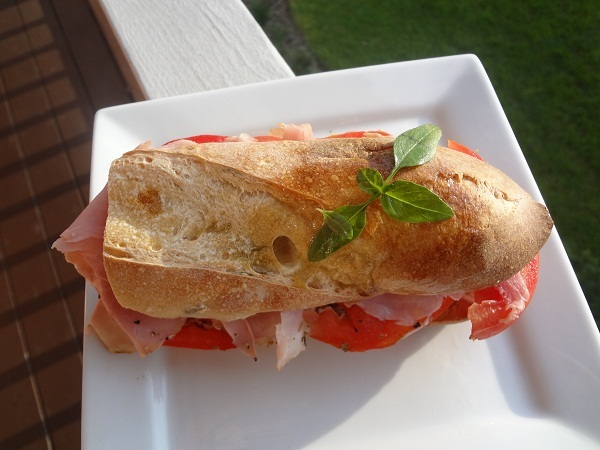 Place mozzarella on top followed by basil, ham slices, and top half of baguette. Enjoy! Nutrition note: Keep your bread and cold cuts (like ham) fresh by freezing them. Don’t forget to slice your bread before you freeze it (if you’re going to want it sliced) and to defrost your cold cuts in the refrigerator the day before you’re planning on using them. I love alliteration. 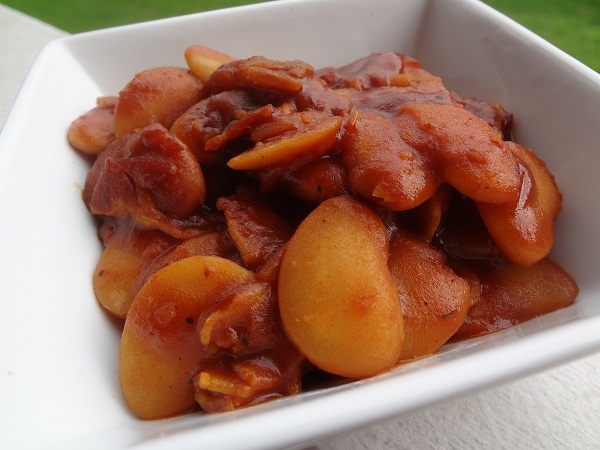 Big BBQ Bourbon Baked Beans with Bacon. Say that three times fast. 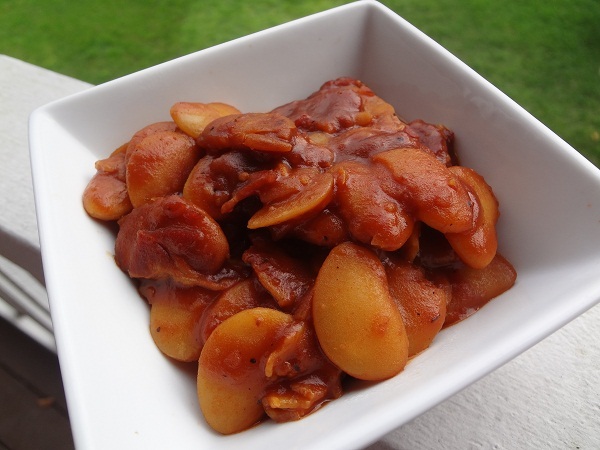 So I know people don’t typically make BBQ lima beans, but why not? These have got big taste and a bold flavor. In a medium pot, add beans and 4 cups of water. Bring to a boil on medium-high heat and boil for 2 minutes. Remove from heat, cover, and let stand 1 hour. Drain beans (discarding water) and rinse. Add 3 cups fresh water to pot with beans. Cover pot with a lid and bring to a slow boil on medium-high heat. Reduce heat to low, tilt lid, and simmer for about 1 1/2 hours. Drain and discard water. Chop bacon and add to the beans along with bourbon and BBQ sauce. Place on medium-low heat with the lid on. Heat for about 45 minutes or until bacon and bourbon have cooked. Enjoy! Nutrition note: Lima beans have a lot of fiber, are a good source of protein and iron, and contain no fat. 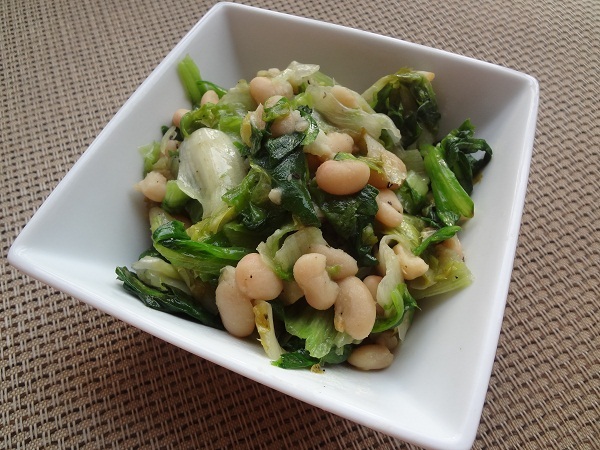 In just 1/4 cup dry lima beans, you can get 48% of the daily value of fiber. Wow! 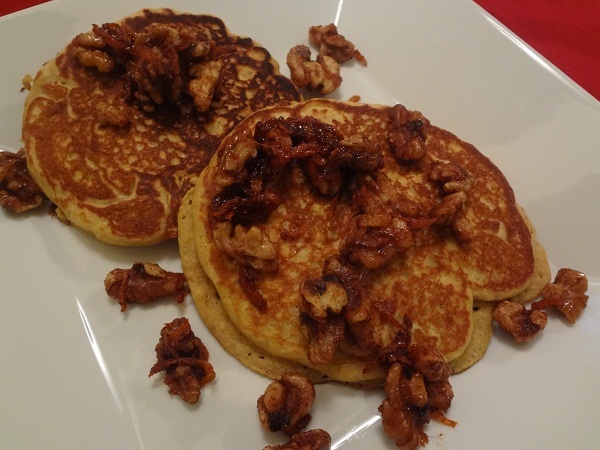 Jamie says: I woke up with this vision for the perfect weekend breakfast- Orange Whole Wheat Pancakes with Orange Cinnamon-Sugar Walnuts- and made it a reality. I was inspired by my recent purchase of fresh-squeezed orange juice from the farmers’ market and my recent discovery of a recipe for Orange-Glazed Pecans from the Florida Department of Citrus. The pancakes were so big and fluffy and had a hint of orange to them. 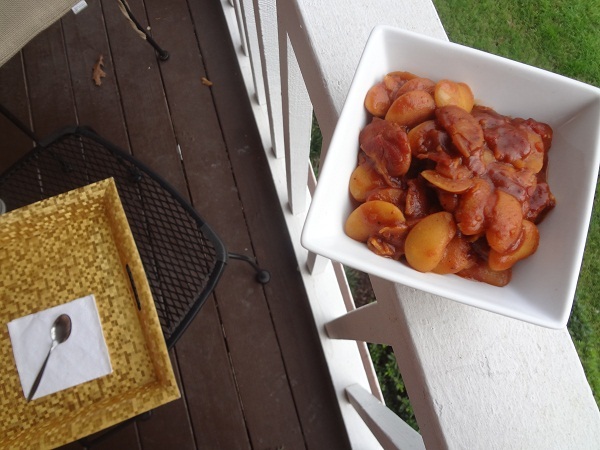 The walnuts were like dessert- cinnamon-spiced, sugar-sweetened, with a burst of orange zest. I paired the pancakes with a glass of milk and was sustained for an exciting horseback riding adventure. Orange you glad you ate a delicious AND nutritious breakfast? Preheat oven to 350°F. Add walnuts to a small bowl and cover with orange juice. Allow to sit for at least 10 minutes. In another small bowl, zest an orange. Add sugar and cinnamon. Stir. In a third small bowl, add pancake mix. 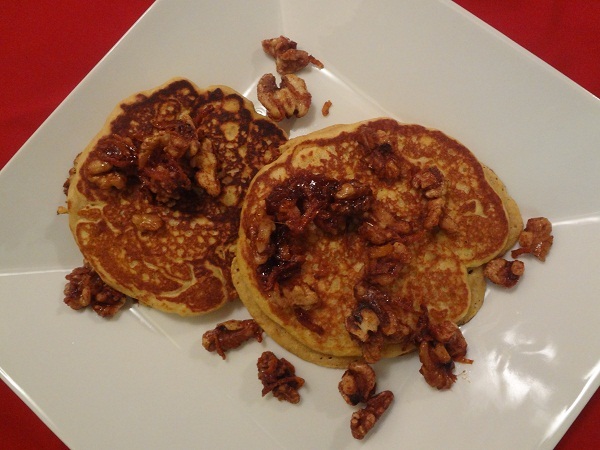 Drain walnuts by pouring the orange juice into the pancake mix. Mix with a fork. Toss orange juice-coated walnuts into cinnamon-sugar bowl. Stir. Spray a small baking pan with no stick cooking spray. Spread spiced walnuts on baking sheet and bake for 12 minutes. Preheat a large nonstick pan on a burner on medium heat. Spray pan with no stick cooking spray and pour batter into circles on pan. Cook for about 1 minute. Flip. Cook an additional minute or until cooked throughout. 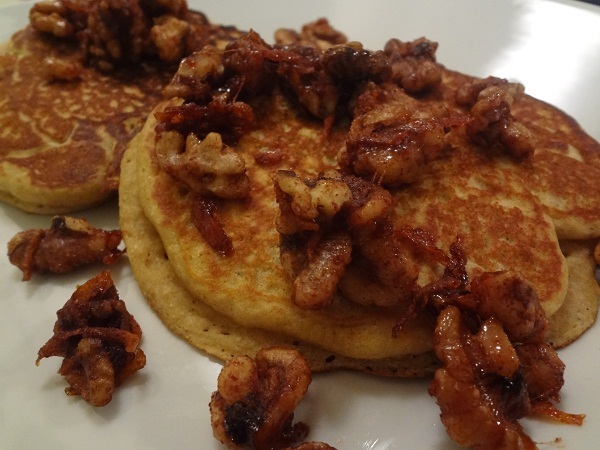 Top pancakes with orange cinnamon-sugar walnuts. Enjoy! Serving suggestion: Serve with orange slices and a glass of milk.